Windows Phone 7 is an excellent new mobile operating system — there’s no doubt about that. But every rose has its thorn, and on Windows Phone it’s a lack of apps. 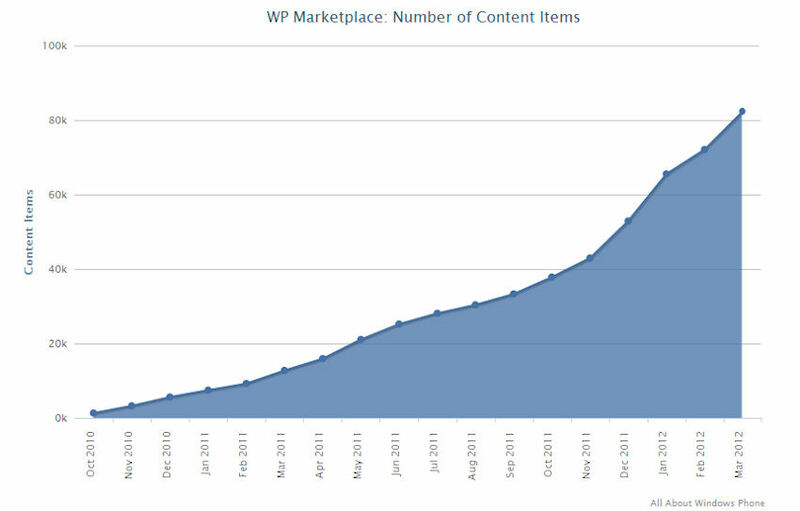 Luckily, the Marketplace seems to be growing at a rapid pace, today topping 80,000 apps. The platform has been slowly but steadily picking up steam, topping 50,000 apps in December, 60,000 in January, and 70,000 in March. All About Windows Phone claims that the Marketplace is growing at a rate of 340 published apps per day. It’s only fair to note that the total number of published items (which would be that 80,000 figure) isn’t the same as the number of total apps available to users. This is because Microsoft removes some of the applications or the developer withdraws them, or simply because not all apps function across every market. The U.S., for example, only has access to about 69,123. Still, it would seem that the Windows Phone Marketplace is growing at a steady pace, which is good news for anyone considering the Lumia 900, set to go on sale this weekend.